The Michael King Writers’ Centre is offering a Residential Workshop for writers. 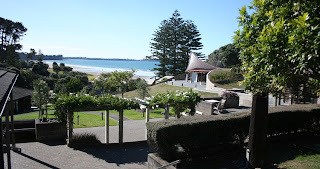 The Centre already runs a series of workshops for emerging writers of all ages at the Signalman’s House on Devonport’s Mt Victoria. Now with the assistance of an Auckland Regional Services grant from North Shore City, the Centre has organised the first of what is intended to be an annual series of Writers’ Residential Workshops covering different forms of writing. While creative writing classes are often held around the country, the few existing non-fiction writing courses rarely go beyond memoir and travel writing. This is the first residential workshop ever held for writers of biography and history and it is fitting that the inaugural workshop should reflect Michael King’s major interests. The workshop’s title, Shifting Sands, expresses the changing nature of history and biography as new facts and viewpoints alter perception and interpretation. Over four days, leading historians and biographers will present their experiences in research, writing, book structure and publishing, and highlight the factors which have changed the ‘way of seeing’ in their fields of research. Writers will gain much from the interaction and intensity of a long weekend at a seaside retreat in the company of colleagues and respected professionals. Distinguished Professors Anne Salmond and Brian Boyd are the keynote speakers at the workshop. Other speakers are Gordon McLauchlan, Caroline Daley, Monty Soutar, Gavin McLean, Janet Hunt, Iain Sharp, Christine Cole Catley, Paul Monin, Deborah Challinor, Paul Diamond, Sandra Coney and publishers Bridget Williams, Sam Elworthy and Geoff Walker. Sessions will focus on literary, cultural, historical and collective biography, New Zealand history from a Maori perspective, themes in New Zealand and Australian history, writing for different audiences, local and regional history, research and publishing. Writers with some publishing record are invited to apply for the Residential Workshop, which is limited to 20 participants. The cost is $495.00 plus GST for three night’s accommodation and all meals. More information about the workshop may be found at www.writerscentre.org.nz. Applications, which should include a writing CV, close 30 June 2009.